My older boy TomÃ¡s is starting school today. He has been looking forward to it all summer. I’m proud and happy and sad all at the same time. Key day Tom and great to mark it like this. I have those days on my private family blog and take those pics every year. Wait till you do the 3 or 4 year comparison side by side. @Keith – a private family blog is a great idea. Still, I have enough blogs to be managing right now!!! @horia = is Helsinki on for definite in Sept? Excellent, if so but they guys were a bit vague the last time. Beer it is, if we go! My oldest daughter Anna is also starting her first day at school today. I’m in the UK today so I’m in her bad books. However the promise of flowers when I collect her next Monday did the trick – they grow up so fast. We’re just about to introduce Adam to solid food in a week or two. Got a couple of more years before he’s out the door to school! 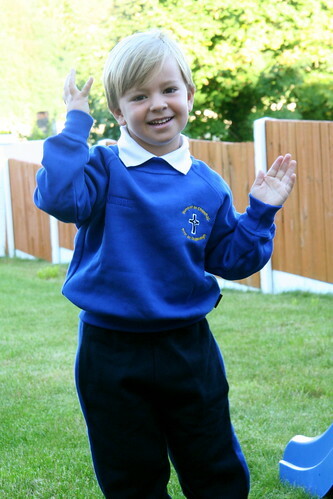 Hi – was trying to find out how to add one of those little facebook bookmark this article to our blog – htt://purple13.blogspot.com and came across the smashing picture of your lads first day at school. My eldest lad has just started secondary school today – i popped round this am to wish him well and took his picture – very smart in his new uniform. P.S no plug here but it would look smashing on one of our photo jigsaws!